New MacBook Air— Now gets Retina display….finally. 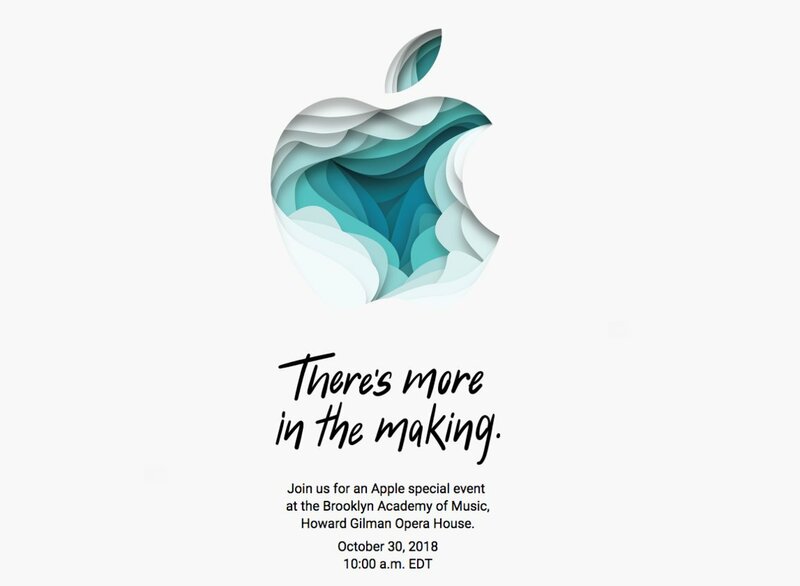 It has no bezel….13.3 inch display. 4x resolution compared to old Air. They have added Touch ID with the keyboard. There’s a T2 chip and secure enclave. The keyboard is improved, and there’s a Force Touch trackpad. Even though it has a 13.3” screen the new Air is 17% smaller than the old air and only weighs 2.75 lbs, dropping a quarter lb. Every new Air is made of 100% recycled aluminum. 1.6GHz i5 processor, 128GB storage, 8GB Ram Starts at $1199 and available next week. Updated Mac Mini— All get 4 cores, with 6 cores available. They aren’t mobile chips, but regular cpu’s. The new Mini is 5X faster. The new Mini is able to support 64 Gigs of memory on SO-DIMMs. They are available with up to 2TB of SSD memory. 4 Thunderbolt 3 ports, HDMI, 2 USB A ports. Mini starts at 799 with a base config of 8GB, 3.6GHz quad-core processor. Order today and available next week. New iPad Mini, iPad, and Pro. The new iPads have Face ID, no home button, a thinner bezel, and a magnetically attached Apple Pencil. The Pro has the ‘liquid retina’ display. With no bezel, it 12.9” screen, but in a smaller package. The iPads Face ID works like it does in the iPhone X, Xs, etc. The new iPads are running the new A12X Bionic chip. There’s an 8 core CPU…7 core GPU. It’s 90% faster, and is faster than 92% of PCs sold in the last year. The new Pro will be available with 1TB of storage, and will get USB-C. You will be able to charge your iPhone from your iPad Pro, too! They demoed a basketball game (NBA 2K Mobile) that looks nearly like video of an actual game. Apple claims this kind of resolution has never been done on a mobile device. Adobe demoed actual Photoshop on the iPad Pro. Adobe also showed off their new augmented reality product, which will be out next year. 11″ starts at $799, 12.9″ starts at $999. Orders start today, arrive November 7. Current 10.5-inch remains at $649. LTE versions available. iOS 12.1 will be available today, with Group FaceTime, eSIM support for iPhone Xs and Xs Max, 70 new emoji, and more. Other things are happening besides with Apple. Twitter is rumored to be considering killing the ‘Like’ button, in order to force more debate between users. CEO Jack Dorsey said so at a private Twitter event last week, according to vox.com. Also of note…increasing the character count from 140 to 280 didn’t really produce an avalanche of longer Tweets. The era of electric aviation is nearly upon us. easyJet says they will launch a 9 passenger electric plane next year. They are also working on a battery powered 150 seat plane for short haul trips of under 300 miles. Electrek.co reports that 30% of flights are in that range, and that Boeing and Airbus sold nearly 1000 jets for those routes last year at around $90 million a pop, so an electric model would really shake up the market. On the heels of introducing their Portal video devices, with the cams that follow you around the room, Facebook is working on one that will live on top of your TV and make it into a giant sized Portal. Engadget.com says it’s code named ‘Ripley,’ and is expected to bow next spring. In not-so-cool news about Facebook, they had previously announced that the Portal devices wouldn’t be collecting your data as the devices live in your house and serve you ads. Well, that may be true, BUT they will be hoovering up your data on who you call, and what apps you use, etc, and THAT data WILL be used to serve you ads on Facebook and its other platforms. Recode.net notes that this shouldn’t be a shock, since Facebook’s entire business model is based on using tons of data about you to serve you ads. Oh…and all the video views they get and how we’ve heard that video is much more important than printed content…well that was basically a big lie. Hire back writers, media…the written word still grabs lots and lots of eyeballs! Not wanting to miss out on the big Chinese market or have sales impeded by the Trump tariffs, Tesla has bought a 210 acre site in Shanghai to build a new factory…one that will make the batteries as well as the cars. Arstechnica.com reports that it is in the so-called ‘free trade zone.’ Tesla expects that in 2 to 3 years, they can be pumping out 500,000 cars a year from the factory, and will avoid having prices increase by 60% if the tariffs continue or increase. Now, you don’t have to be a public figure or a security wizard to rock your own private email server. Now, there’s Helm, a gadget that looks like a peaked roof on a tiny doll house or a hardcover book sitting on its edges with the spine at the top…that makes it as easy to set up a personal email server as setting up an Amazon Echo. Mashable.com notes that with your own server, your email will be physically in your home, not in the ether on some cloud server somewhere…but it’s still accessible from anywhere. The gadget has 128Gigs of built in storage and has a tray that can add up to 5 TB more. It’s $499, but you’ll need their update service (for security updates) for $99 a year, too. The Helm has a security key…actually a physical, metal key that plugs into a port on the top. Even if someone got physical access to the server, without the key, all is encrypted. There’s a back up electronic key that can live on your phone. It’s comparable with any email client that works with IMAP mail, including Apple Mail, Microsoft Outlook, and a number of others. The service will walk you through migrating cloud service mail like Gmail to the little box. Palm is rolling out a tiny phone…and we mean tiny. It’s smaller than the original iPhone- in fact, just a bit bigger than a credit card. 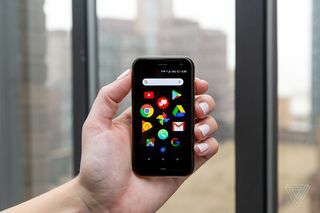 Theverge.com reports that the micro-phone (sorry) will run $349.00 and be exclusive to Verizon. Actually, a San Francisco startup bought the rights to the Palm name, and is making the gadget. You can add it to your verizon plan, and it shares the number with your ‘main’ smartphone. It is designed to be for use on weekends, or when you go out, or anytime you don’t want all the distractions of your larger phone. The little Palm does run a full version of Android 8.1 and all apps in the Google Play Store. As an additional incentive to buy something you can’t possibly need, there are Steph Curry designed cases…so you can strap it to your forearm during workouts and Kate Spade clutches for the diminutive handset, too! The new Pixel 3 phones have an amazing camera, and now Google is giving people a chance to up their game in shooting video with their phones. Starting October 18th, the Pixel App will support external mics. Engadget.com reports that a bonus is that the feature will work on all pixel phones, not just the brand new 3’s that come out Wednesday! Whether you’re a video blogger, a filmmaker, or just want to get better video and audio than ever before from a phone, the Pixel will be a serious help. Apparently, all Android friendly wired external mics will work with the app. Amazon has debuted a Shark Tank Collection on Amazon Launchpad, its platform for hardware and physical goods startups. According to techcrunch.com, Amazon will feature over 70 products that successfully got funded in seasons 1 through 9, and further new products will be added in from season 10 and beyond. We’ve all seen the news stories lately about very old criminal cases being solved by DNA…from relatives that sent theirs in to sites. Now, wired.com says that so many people have used Ancestery or 23 and Me that 60% of Americans with European ancestors can be identified via their DNA using open genetic genealogy sites, even if they have never sent in a spit kit. The DNA of relatives can so narrow down a number of people, that most anyone can be found then using public records. Scientists say that with only 2% of adults in an ethnic population are in the database, a match can be made to at least a third cousin or closer on almost any person of interest. We’ve reached a degree of privacy invasion that even Orwell never anticipated! Big Brother doesn’t NEED to watch you…he can find you through your DNA!